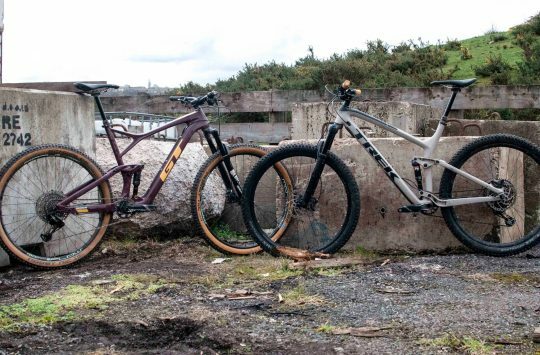 As part of a head-to-head review feature, Rob’s been testing two 130mm travel 29er trail bikes; the 2019 GT Sensor Expert and the 2019 Trek Fuel EX 9.7. So which one has come out on top? Read on for Rob’s review of the GT Sensor Expert. The history of GT is vast, and the success it’s enjoyed across all disciplines over the decades really has few equals. In recent years however, it would be fair to say that the iconic American brand has slipped down the pecking order somewhat. After a few years of being idle in the Trail and All Mountain categories, GT is hitting back with not one, but two entirely new bikes: the revamped Force and Sensor. 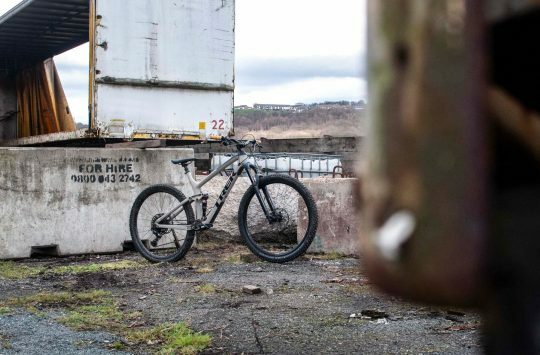 For this review, we’re looking at the shorter travel bike of the two, the Sensor, and in this specific case, the GT Sensor Expert. 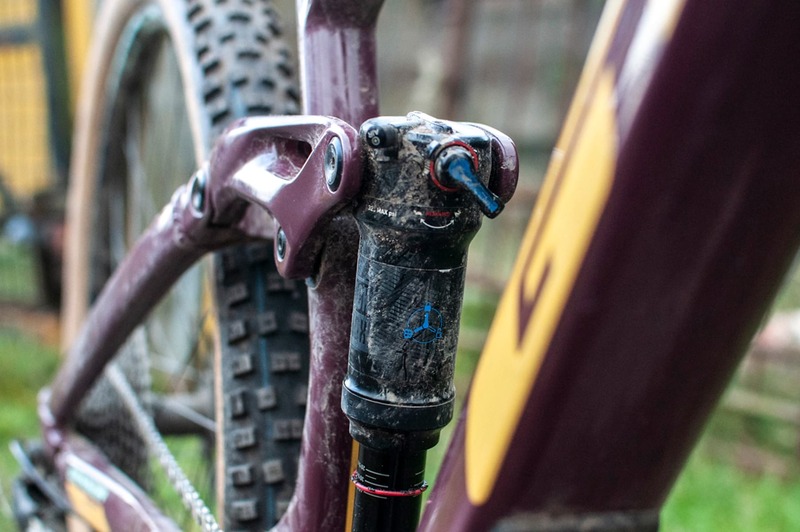 In redesigning the Sensor from the ground up, GT has ditched the previous AOS suspension design, rewinding the years and returning to the LTS (Linkage Tuned Suspension) name that is so synonymous with the GT bikes of old. Instead of the floating BB found on the AOS and i-Drive platforms, the new Sensor gets a proven four-bar Horst link suspension design. Back to simplicity for GT with the new Sensor. Unlike other brands that offer bikes in a huge number of specs and models, GT offers the Sensor in just five. Two alloy framed iterations, and three carbon framed versions. The GT Sensor Expert sits in the middle of the bunch and is equipped with a carbon front end, and a welded alloy rear. Finished in a deep shade of Châteauneuf Du Pape, set off with yellow decals, it’s going to split the opinions. And if the paint job doesn’t, surely the gum wall tyres will. As mentioned above, the Sensor runs a four-bar suspension system, activated by Horst links on the chainstays and delivering 130mm of travel. 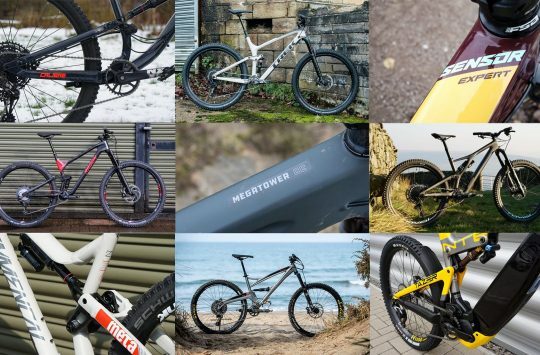 Although we’re used to seeing four-bar suspension platforms now, and whist some may suggest that GT has simply copied other manufacturers, is that necessarily a bad thing? It’s a proven system that works, and there is plenty of room for originality within the system when it comes down to kinematic design. 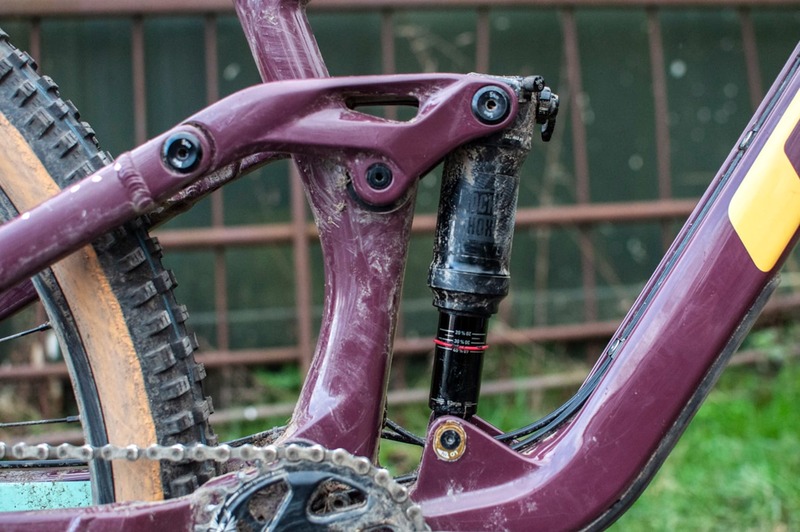 Going back to a four-bar suspension design has made the bike a much simpler affair. With a 65.5° head angle, this ain’t no XC whippet, but with 29in wheels and 130mm of travel, it also isn’t an enduro ripper. Because of that, the Sensor aims to slot right into the do-it-all trail bike category. Looking after suspension, a trunnion-mounted RockShox Deluxe RT3 rear shock offers two positions of damping and buttery smooth action from the DebonAir spring. Up front, a RockShox Revelation RC also supplies 130mm of travel, fitted with the Charger damper. There are a few super neat frame details on the Sensor that we’ve got to take a look at. The Revelation up front has been supportive, but we’d like to see something a bit more adjustable for this price. Down at the base of the shock, neatly set into the carbon frame, we find a flip-chip. This allows riders to adjust the head angle of the Sensor by 0.5°, and drop or raise the BB height by around 7mm. All of which can be done whilst out on the trail, using an Allen key on your multitool. Other numbers to note are a seat angle of 76°, a reach figure of 495mm (X-Large) and 435mm chainstays. We’ve also got the ‘groove tube’ on the carbon version of the Sensor, which is a recessed section on the down tube. This houses cables for the rear mech, rear brake and dropper post, giving the Sensor a clean silhouette. Unfortunately, this isn’t a feature on the alloy frame though. Everything other than the stealth dropper post uses external cable routing, which is an incredibly refreshing bit of design to see. Easy to get at, and easy to maintain. 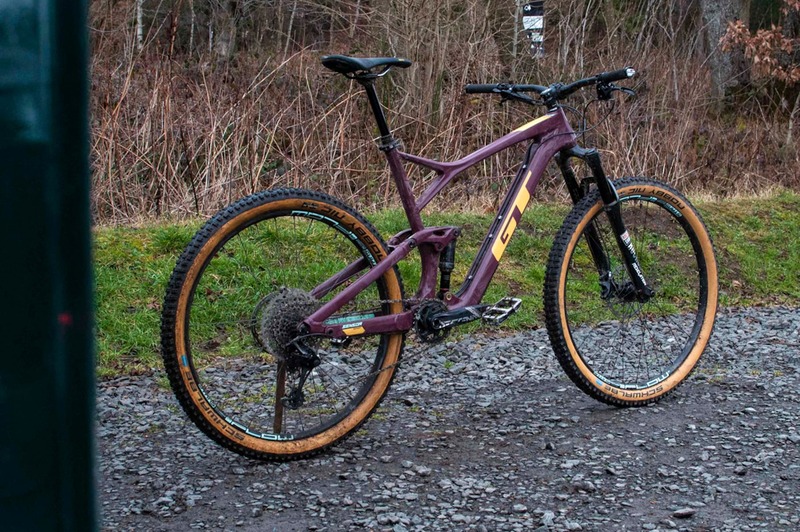 Although GT has updated the suspension platform and overall aesthetic on the new Sensor, it has kept GT lovers happy by sticking with the ever-recognisable Triple Triangle frame design, finished off with the seat tube support. The X01 mech is excellent. But perhaps going with a full GX 1×12 drivetrain would have let GT put the money into better parts elsewhere. GT has spec’d brakes from SRAM, in the shape of the Level TLs. 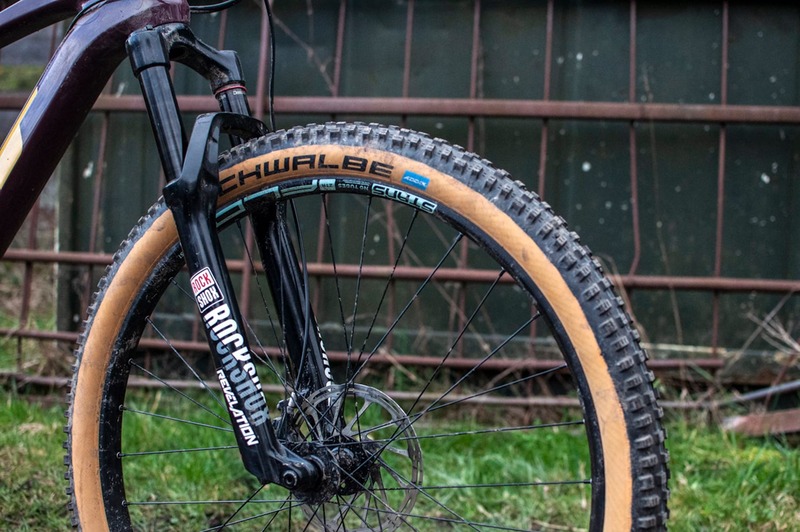 For rolling, we’ve got Stans NoTubes Flow S1 wheels wrapped with Schwalbe Nobby Nics (more on those later). 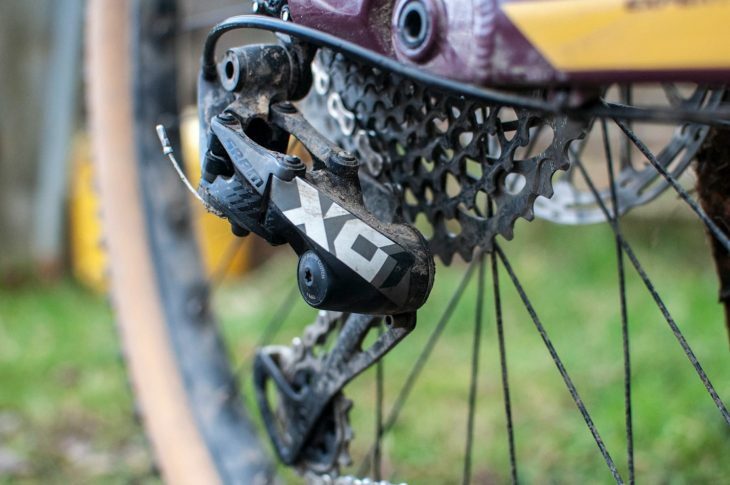 The drivetrain is a mix of a GX Eagle shifter and chain, with a Truvativ Descendent Carbon crankset, and it’s pimped up with a X01 rear mech and cassette. To suit my 6’2″ (188cm) stature, I’ve got an XL on test here. It’s the biggest that GT offers, and with the huge space in the main frame in this size it does look big. Straight out of the box though, the Sensor felt great for my 6’2″ height. Yeah, it’s big – but it doesn’t feel overly so. The length feels comfortable, and when riding it feels stable. The 780mm wide bar on this bike is a good match for the aggressive geometry. I kicked off the testing with the flip-chip set to low, which is the slacker of the two settings, offering a 65.5° head angle. Throughout the test I wanted to play around with the flip-chip to see how the bike would perform in each setting. From the get-go I set the suspension up pretty firm. That suits my style of riding, especially at bike parks and on flowy trail centre loops. The mud tells the story. Plenty of good times aboard the Sensor Expert.